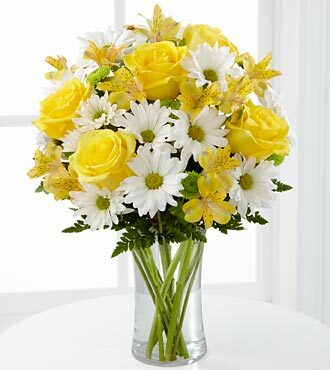 The FTD Sunny Sentiments Bouquet is a blooming expression of charming cheer. Sunny yellow roses, Peruvian lilies, daisies and green button poms hand-arranged by your neighborhood FTD artisan florist create a memorable bouquet perfect for celebrating a birthday, anniversary, sending your congratulations or thank you. It comes in a classic, clear glass vase.